We got on the road today at around 10AM. Took time out this morning to do a Pimsleur Spanish before we left, and we hope to do another one tonight. We’re putting ourselves on a two-a-day schedule in an effort to become a bit more proficient. We do seem to be doing fine on the extremely rudimentary Spanish we have, though – we’ve been able to buy things and book hotels and ask for directions. We just can’t carry on a conversation. Riding today out of Ciudad Valles toward Xilitla was much nicer than the riding we’ve been doing. We were riding along lush roadways with nice plantations and ranches – not the soulless, corporate mega-farms we’d seen closer to the border. You still get a sense that most of the people in this part of Mexico are poor, too, but they seem to have more pride. Things seem better cared-for. Many of the buildings are brightly painted or cleaner than the ones we’d seen in the past couple of days. Everything here seems a bit more human. 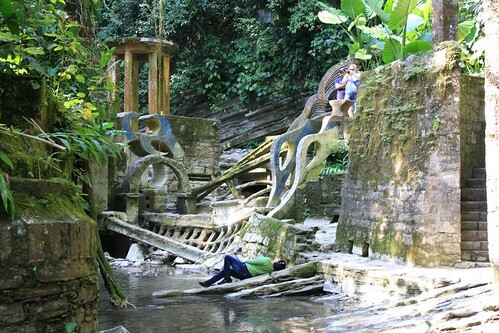 Today we saw Las Pozas De James – the place that Edward James had built. It was really surreal (although not in the way people have apparently compared it with surrealist art, which was in many of the descriptions that Kay read for the place.) It was these massive, oddly-shaped stone structures integrated with the jungle. Jungle grew in some of the structures. In other areas, the structures took advantage of the natural landscape, incorporating waterfalls and pools of water. We bought a map for $25 MEX (a little over $2 US) but it didn’t help much – we kept getting lost amidst the criss-crossing staircases and multiple, unclear pathways between parts of the place. It was really interesting and definitely worth exploring, in spite of the fact that many parts of it triggered my fear of heights and I wasn’t able to enjoy it as much as I think I would have otherwise. Las Pozas also highlighted the fact that many of the things we’ve seen here simply wouldn’t be accepted in the United States. 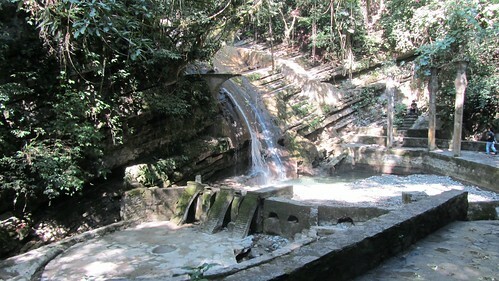 At Las Pozas, for example, there are tons of staircases with no railings, high platforms with no rails or protection to prevent people from falling, and even a tricky waterfall crossing on a ledge approximately 18 inches wide, with a pool of water on the right and a sheer fall down a cliff on the left. 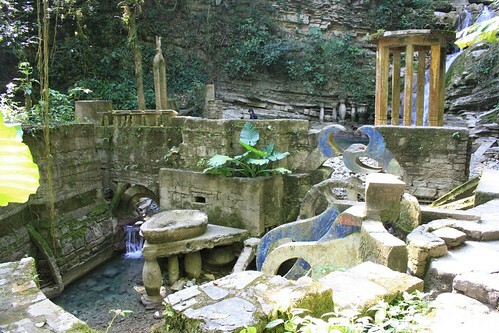 The fact that Las Pozas can exist in its natural state is a testament to the fact that in Mexico, a lot more things are acceptable. In some ways, this is refreshing from the liability-aware, ever-fearful-of-a-lawsuit United States. The riding to and from Xilitla was also amazing. We took route 85 south from Ciudad Valles, toward route 120 to Xilitla. It was only 14 kilometers on 120, but it was mountainous, twisty and beautiful. In the end, we went back down 120 to hook up with 85 again, thinking it would be faster to get south toward our next waypoint. Unfortunately, 85 through here also goes through mountains and around these amazing twisties, so we only managed to cover 109 miles in the roughly 4 hours of riding we did today. Around 5PM, the sun was setting (as it does early in the mountains) and we had no hope of getting to the next town along our map, which was 175 kilometers. We just happened into Chapulhuecan. We knew we had no chance of hidey-camping tonight, because the road was sheer cliff on one side and sheer drop-off on the other. No place to pitch a tent, and not even any side-roads to go down to try to find a place to camp. Luckily, Chapulhuecan had a hotel, and we wisely decided not to try to go any further. Otherwise, we’d probably still be puttering along in the dark. Today’s hotel appears to be a family-run establishment – i.e. it’s a very large house that this family has turned into a hotel. There’s a common area with a television where they sit and watch the news after dinner, and the wife clearly does most of the running of the place. The rooms have a feminine touch, with cute rugs and curtains that aren’t the typical nondescript curtains you find in a large, impersonal hotel. There was a minor snafu with our booking process – Kay went in to get us a room and apparently at one point, the woman asked “Two hombres? In one bed?” Kay wasn’t thinking and said yes, that would be fine – and then realized when he came out that they probably thought we were both guys. He asked me to say hi when we went in, so she’d know I was a woman, so I did one better and unzipped my jacket – I was wearing a girly shirt with a floral print and a feminine cut today. When I went inside with my stuff and greeted the woman, she smiled warmly, and then asked if we wanted a bigger room. We declined because we already had most of our stuff in the room she’d originally given us. Kay and I think she gave us a bit of a crappy room because she thought we were two guys sharing a bed – we’ll be more careful about this perception in the future. Kay asked about secure parking for the bikes, and they told us to wheel the bikes right up onto the front porch. They were literally in front of the doors to the hotel, under the covered porch/sitting area. We locked the tires between the bikes and locked the bikes together, and anyone who wanted to make off with them would have had a hard time. After unloading our stuff, we went out in search of food. We’ve found that in most of these small towns (and even the bigger ones like Ciudad Valles where we stayed last night) restaurants tend to close early. A pizza joint where we ate last night closed at 8PM – unheard of in the U.S. It was after 6PM when we went searching for food, and we walked up and down the town and finally settled on the only place that seemed open – a literal hole in the wall with signs for hamburguesas. When we walked up, there was a woman and her two daughters sitting around a table that protruded out into the sidewalk. We asked about hamburguesas, and they shot into action – turning on lights and firing up a grill. While we were standing there, we saw a sign for types of hamburguesas and prices on the wall, and saw a sign for a “doble hamburguesa” that was only $3 MEX more than the regular one. We asked to amend our orders to that, not sure what we’d get, and we ended up with these delicious hamburgers with lettuce, onion, cheese, thin-sliced and fried ham (think Canadian Bacon), jalapenos and some sort of mayo. They were DELICIOUS. Two of these beauties for $46 MEX, or just under $4 US. It was a good note to end the night. Today’s lesson: don’t think you can get very far in the mountains, because you can’t. Geez. 40KPH all day long and that was the right speed, based on the roads and curves. Not much forward motion, but a beautiful day on the bikes. Previous post: Previous Post Early observations on Mexico.